Mrs. Lincoln's Inkin: Thank You For Your Service!! Hello everyone. Happy Memorial Day. 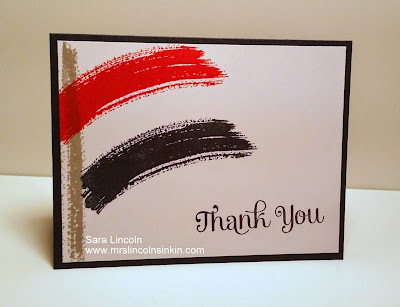 Today is a quick post of a simple card that I made to thank all the men and women who have lost their lives, serving our Country and to all of the families that they have left behind. My family truly thanks you!!! I used the Work of Art stamp set along with the colors Real Red and Night of Navy that I wanted to represent the flag. This is a super simple, I mean really simple but I love that about this card. I love that something as strong as the message of "Thank You" for a day like today didn't need a lot going on.